Funny, touching and full of action and smart in-jokes, Citadel is Mass Effects heartwarming last hurrah to its fans. You can start the five-hour Citadel storyline at any time after the Cerberus coup during Mass Effect 3's campaign, but it's best saved until the last possible moment. The final chunk of Mass Effect 3 DLC doesn't try to expand the universe or add extra dimensions to Shepard's mission to destroy the Reapers – it's a sweet, funny goodbye hug for long-term fans of the series. "The incident kicks off a tumbling gunfight that travels deep into the bowels of the Citadel"
It starts with an email. Old war buddy Anderson tempts Shepard back to the Citadel with the promise of shore leave in his stunning apartment, situated at the heart of the Citadel's hottest entertainment district. 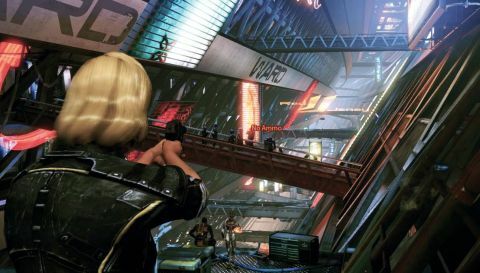 Before you have the chance to order a starter at the 'authentic French sushi' restaurant though, armed goons storm in and demand Shepard's surrender. The incident kicks off a tumbling gunfight that travels deep into the bowels of the Citadel. Who are these men? Who do they work for? How do I stop them? These questions drive Shepard through Citadel's self-contained quest, which is a mix of combat, elaborate party scenes and quiet moments of reflection with your crew. Your crew members are what Citadel is really all about. You begin alone with a silenced pistol – one of two new weapons – but as news of your predicament spreads, old friends flock to your side one by one. You will fight alongside characters from all three games in scenes that trade so heavily on nostalgia they're almost overindulgent. But Citadel's tone is perfectly pitched. It's affectionate and playful – frivolous, almost. The celebratory action hero entrances your crew receive are mediated by a persistent self-deprecating streak. When your entire crew get the chance to leave the Normandy and go on a mission together for the first time, there's a spree of smart-arsed quips from your crew. Later, Garrus makes a joke about calibrating things. Tali yearns for an air conditioning unit for her environmental suit. The in-jokes flow thick and fast, and they're genuinely funny. "Citadel's tone is perfectly pitched. It's affectionate and playful – frivolous, almost." If you haven't played the first two games, or don't especially care for Mass Effect's weird band of space-rangers, then much of what makes Citadel special will be lost, but even if you strip away the nostalgia this is a varied, well-paced slice of DLC. Combat encounters initially lack variety – enemies are little more than reskinned Cerberus agents – but when you get access to the new entertainment zone you can test your fighting skills in an addictive ladder of combat challenges. Victory here will earn you credits that let you unlock new maps, armour sets, squadmates and enemies. Citadel's final act is especially good. With the mission complete, you must throw a party for your team. Decisions you make at several points during the evening affect how rowdy your companions get. Hilarity ensues. This is a fitting farewell for Mass Effect's team of legends.